It used to be India that followed in the footsteps of British societal traditions. But now seemingly the tides appear to be shifting as a number of famous political offspring in the UK are being groomed to mimic the impact their parents had on the Westminster political scene. The economic impact of annexing Crimea from Ukraine could drive Russia into a sharp recession this year even if the West stops short of trade sanctions, the World Bank warned on Wednesday. A key Congressional committee has slashed $10 million in American aid given to Pakistan which will now be used to extend fresh financial assistance to crisis-hit Ukraine. The banned Pakistani Taliban today agreed to continue its ceasefire after holding first-ever direct talks with government negotiators at an secret location in the restive tribal region of North Waziristan. Suleiman Abu Ghaith, a son-in-law of Osama bin Laden, was found guilty of terrorism-related charges on Wednesday following a three-week trial that offered an unusually intimate portrait of Al-Qaeda's former leader in the days after the September 11, 2001 attacks. Aspirants for the coveted H-1B visa can start submitting their applications from April 1, a federal US agency has announced. In the "most credible lead" so far in the multi-nation hunt for the crashed Malaysian airliner, 122 objects were spotted in the remote southern Indian Ocean by a French satellite that could possibly be the debris of the ill-fated plane that went missing 18 days ago. Just as the Nehru-Gandhi dynasty has rooted itself firmly in the spine of Indian politics, so there are moves afoot for a Prime Minister Blair junior, just as there were once plans decades ago to pave the way for a reign of Churchills. Churchill's political line died out with him, although a grandson, young Winston, did manage to cling on to a parliamentary seat for 27 years. And Winston senior's daughter, Mary, married a Conservative MP, Lord Soames, who served in a succession of Conservative cabinets. No British political family, however, has quite managed to emulate Jawaharlal effectively passing the baton to his daughter Indira, who in turn passed it on to her older son, Rajiv. Now it is Rajiv's son, Rahul, and his king-making mother, Sonia, who aspire to continue the family business. And who can forget the political background of External Affairs Minister Salman Khurshid, whose late father was also a former External Affairs Minister, a grandson of the late President Zakir Hussein. In the UK, there has been a recent father-son succession with the late Tony Benn, himself a divisive Labour cabinet minister, and his son Hilary, who served in the previous Labour government, and who currently resides on the opposition front bench in the House of Commons. Additionally, current British Prime Minister David Cameron is the great grandson of former Conservative MP William Mount, young Ben Gummer, MP, is the son of former Conservative agriculture minister John Gummer, and Jacob Rees-Mogg, MP, is similarly the son of former Conservative minister Lord Rees-Mogg. Tony Blair's eldest son, Euan, is being primed to stand as an MPO with all the obvious connotations and comparisons with his distinguished father. Thirty-year-old Euan is not the only one of his political generation seeking to follow in a parent's footsteps. Other so-called Red Princes include Will Straw, son of former Foreign Secretary Jack Straw, and David Prescott, son of former Deputy Prime Minister John Prescott. The sheer number of current and future aspiring MPs with political relations has prompted a senior Conservative MP to warn of the pitfalls associated with nepotism in Westminster. Education Minister Liz Truss contends that too many MPs from the same family leads to the 'usual suspects' winning elections and undermining the principle of meritocracy. * Those who moan about the nepotism in the Lok Sabha should take note of a recent survey House of Commons survey which found that 57 out of 650 current MPs are related to other serving or former MPs. * They include six married couples, 21 MPs with parents who served in the Commons and three pairs of siblings. The gloomy assessment, far more negative than Russian government forecasts, came on a day when US President Barack Obama was meeting European Union and NATO leaders to discuss how to reduce Europe's dependence on Russian energy and bolster NATO defences of east European allies bordering Russia and Ukraine. Obama and leaders of the Group of Seven major industrialized nations agreed this week to hold off on tougher economic sanctions unless President Vladimir Putin takes further action to destabilise Ukraine or other former Soviet republics. Western concern has focused on Russian troops massed on Ukraine's eastern border amid Kremlin allegations of attacks on Russian speakers in that industrial region of the country. But Polish Prime Minister Donald Tusk said on Wednesday it seemed likely that the firm Western response so far would stop Russia undertaking what he called "other acts of aggression and interference on the territory of Ukraine". A World Bank report on the Russian economy, compiled before the most recent evidence of the scale of capital flight, made clear Moscow was already set to pay a significant price in lost growth due to the most serious East-West confrontation since the end of the Cold War. Gross domestic product (GDP) could contract by as much as 1.8 per cent in 2014 if the crisis persists, it said. Russia accused Ukrainian officials on Wednesday of barring crews of Russian commercial airlines from going outside their planes in Ukrainian airports. Russia's foreign ministry said in a statement that Ukrainian border guards have been forcing cabin crews of Aeroflot, the state-controlled Russian airline, to stay inside their planes. The ministry said the decision violates international law and ultimately "poses a threat to the safety of civil aviation" because the crews cannot rest properly. The ministry said that it had sent protest notes twice to the Ukrainian embassy in Moscow. Kiev: Ukraine's former prime minister Yulia Tymoshenko was plunged into fresh controversy after Russian television broadcast a tape where she is heard urging the "wiping out" of Russians over Moscow's seizure of Crimea. Tymoshenko, a hugely controversial figure both in Ukraine and Russia who was released from jail last month, confirmed the voice was hers but said some of the comments had been manipulated. AFP. The $10 million taken from the annual $1.5 billion aid to Pakistan would be used to carry out programming in the Ukrainian, Balkan, Russian, and Tatar language services of Radio Free Europe and Radio Liberty and Voice of America, the House Bill said. The legislation, HR 4278, the Ukraine Support Act, was passed yesterday by an overwhelming bipartisan support by the powerful House Foreign Affairs Committee. Introduced last week by the committee Chairman Ed Royce and Ranking Member Eliot Engel, it promotes Ukraine's sovereignty and democratic institutions while sanctioning those who have sought to undermine it's independence and stability. The issue of moving funds from the Kerry-Lugar-Berman Bill, which is officially known as the Enhanced Partnership with Pakistan Act of 2009, was raised during the mark up of the bill by the House Foreign Affairs Committee. 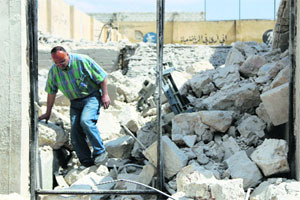 Continuation of ceasefire was one of the primary demands of the government. The month-long ceasefire announced by the Tehrik-e- Taliban Pakistan (TTP) would have ended on March 30. The first-ever direct talks were held to chalk out a solution to the deadly cycle of violence that has claimed over 40,000 lives. Soon after the talks, local media reported that Taliban has said ceasefire will remain in place throughout the dialogue process. Abu Ghaith, 48, a Kuwait-born teacher, faces life in prison after a federal court jury in New York convicted him of conspiring to kill Americans, conspiring to provide material support for terrorists, and providing such support. As in the previous years, the US Citizenship and Immigration Services (USCIS) can issue a maximum of 65,000 H-1B visas, which is quite popular among IT professionals and companies in IT services. With the American economy recovering and much emphasis on information technology sector both by Obama administration and the private sector, the demand for H-1B visas is expected to be met in the first few days of April 1, experts note. "Due to the high level of premium processing receipts anticipated, combined with the possibility that the H-1B cap will be met in the first five business days of the filing season, the USCIS has temporarily adjusted its current premium processing practice," the USCIS said. * The first 20,000 petitions filed on behalf of individuals with a US master's degree or higher are exempt from the cap. "The Malaysian Remote Sensing Agency (MRSA) analysed the images and-in one area of the ocean measuring some 400 sq km-were able to identify 122 potential objects," Acting Transport Minister Hishamuddin Hussein said today. The objects were detected on Sunday, a day before Malaysia announced that Flight MH370-carrying 239 persons on board-had crashed into the southern Indian Ocean without any survivors. The MRSA received new satellite images yesterday from France-based Airbus Defence and Space-a division of Europe's Airbus Group, he said, adding they were taken on Sunday. 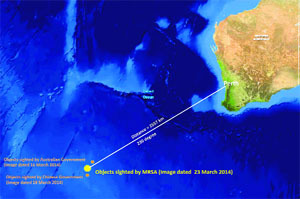 The new images showed potential objects about 2,557 km from Perth in the southern Indian Ocean and ranged from 1 to 23 metre in size.